English : Drone Video of two big lakes of Ladakh region of Jammu & Kashmir. Both the lakes are accessible from Leh city and provide a breath taking view. 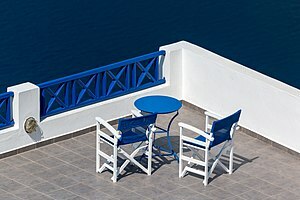 Best view of the lake comes in afternoon when sun shines at its peak and the water looks extremely blue. Drone used: DJI Phantom 3 Advance. Island in Monrepos Park in Vyborg, Russia. English : Island in Monrepos Park in Vyborg, Russia. English : Meet John Doe is a 1941 American film directed and produced by Frank Capra, starring Gary Cooper and Barbara Stanwyck. View at dusk of the Basilica of Our Lady of Sorrows, Queen of Poland, located in the village of Licheń Stary, near Konin, Greater Poland Voivodeship, Poland. The basilica, designed by Barbara Bielecka was built between 1994 and 2004. With a 120 metres (390 ft) long and 77 metres (253 ft) wide nave, a 98 metres (322 ft) high central dome, and a 141.5 metres (464 ft) high tower, it is Poland's largest church and one of the largest churches in the world. 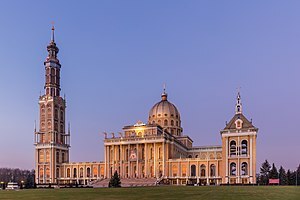 English : View at dusk of the Basilica of Our Lady of Sorrows, Queen of Poland, located in the village of Licheń Stary, near Konin, Greater Poland Voivodeship, Poland. The basilica, designed by Barbara Bielecka was built between 1994 and 2004. With a 120 metres (390 ft) long and 77 metres (253 ft) wide nave, a 98 metres (322 ft) high central dome, and a 141.5 metres (464 ft) high tower, it is Poland's largest church and one of the largest churches in the world. English : Wikimedia Conference Russia 2018 in Saint Petersburg. Worm's-eye view of HVB Tower, an administrative building of the HypoVereinsbank in Munich. English : Worm's-eye view of HVB Tower, an administrative building of the HypoVereinsbank in Munich. English : Traditional Persian music recorded by Edmund Pierce in Tbilissi before 1910. 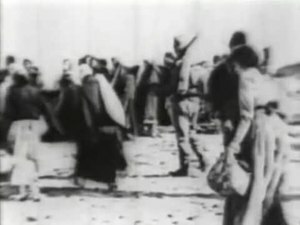 English : Surviving fragment of Ravished Armenia, a 1919 American silent film on the 1915 Armenian Genocide directed by Oscar Apfel. Young Nubian ibex (Capra nubiana) on a stone wall by the edge of Makhtesh Ramon in Mitzpe Ramon, Israel. English : Young Nubian ibex (Capra nubiana) on a stone wall by the edge of Makhtesh Ramon in Mitzpe Ramon, Israel. English : Trailer for Roman Holiday, a 1953 American film directed by William Wyler, with Audrey Hepburn and Gregory Peck. View of Shāh Chérāgh (Persian for "King of the Light"), a funerary monument and mosque in Shiraz, Iran. It houses the tomb of the brothers Ahmad and Muhammad, sons of Mūsā al-Kādhim and brothers of ‘Alī ar-Ridhā. The two took refuge in the city during the Abbasid persecution of Shia Muslims. The tombs became celebrated pilgrimage centres in the 14th century when Queen Tashi Khatun erected a mosque and theological school in the vicinity. English : View of Shāh Chérāgh (Persian for "King of the Light"), a funerary monument and mosque in Shiraz, Iran. It houses the tomb of the brothers Ahmad and Muhammad, sons of Mūsā al-Kādhim and brothers of ‘Alī ar-Ridhā. The two took refuge in the city during the Abbasid persecution of Shia Muslims. The tombs became celebrated pilgrimage centres in the 14th century when Queen Tashi Khatun erected a mosque and theological school in the vicinity. Lower Shavlinskoe Lake at Altai Mountains in Altai Republic, Russia. English : Lower Shavlinskoe Lake at Altai Mountains in Altai Republic, Russia. English : Kurathiyattam - A folklore theater dance of Kerala, India. Nokia Networks, Munich office: Worm's-eye view. English : Nokia Networks, Munich office: Worm's-eye view. Astronaut Paolo Nespoli introducing himself, from space. English : Astronaut Paolo Nespoli introducing himself, from space. English : Arabian toads (Bufo arabicus) at a pond in a wadi in the Al Hajar Mountains, Emirate Ras al-Khaimah, United Arab Emirates. Frontal night view of the History Museum of Armenia, Republic Square, Yerevan, capital of Armenia. The museum, founded in 1920, has 400,000 objects belonging to the departments of Archaeology (35% of the objects), Numismatics (45%), Ethnography (8%), Modern History and Restoration. English : Frontal night view of the History Museum of Armenia, Republic Square, Yerevan, capital of Armenia. The museum, founded in 1920, has 400,000 objects belonging to the departments of Archaeology (35% of the objects), Numismatics (45%), Ethnography (8%), Modern History and Restoration. English : The Road from Pangong Tso to Tso Moriri After riding 60km in wilderness and 60km along India-China border, we finally got a glimpse of good road but at the same time were greeted by "Mighty" and "Overflowing" Indus River. The Road was completely submerged leaving no boundary between the river and the road, leaving us with confusion and despair. After 15min a J&K Roadways bus came as a saviour and showed us the exact path to cross the water crossing. Finally we were able to cross the stretch while powerful Tata 207 failed to cross. A Yellow-billed shrike (Corvinella corvina corvina) from The Gambia. Shrikes catch insects and impale their bodies on thorns or other sharp points, keeping them for later. English : A Yellow-billed shrike (Corvinella corvina corvina) from The Gambia. Shrikes catch insects and impale their bodies on thorns or other sharp points, keeping them for later. English : This animation shows a mechanical grape harvest. The harvester moves along the vine, collecting the grapes, before the internals of the harvester working are shown. One of the sphinxes at University Embankment in Saint Petersburg, Russia. English : One of the sphinxes at University Embankment in Saint Petersburg, Russia. English : Martha Argerich, presents herself in English, Spanish and French, after a concert at the Israel Philharmonic house, 11/10/18, Tel Aviv, Israel. English : Video of a 1930s dotted-line drawing tool. Pyrus pyrifolia "Raja" cultivar fruit, Virginia Beach, Virginia. These pears have an orangy tinge because they are fully ripe. English : Pyrus pyrifolia "Raja" cultivar fruit, Virginia Beach, Virginia. These pears have an orangy tinge because they are fully ripe. English : Main nave of the Church of the Society of Jesus (La Iglesia de la Compañía de Jesús), a Jesuit church in Quito, Ecuador. The exterior doesn't give an idea of the beauty of the interior, with a large central nave, which is profusely decorated with gold leaf, gilded plaster and wood carvings, making of it the most ornate church in Quito. The temple is one of the most significant works of Spanish Baroque architecture in America and considered the most beautiful church in Ecuador. Aciagrion occidentale, Green striped slender dartlet, is a species of damselfly in the family Coenagrionidae found in India, Sri Lanka. English : Aciagrion occidentale, Green striped slender dartlet, is a species of damselfly in the family Coenagrionidae found in India, Sri Lanka. Adam Thoroughgood House, built circa 1719. Thoroughgood was a prominent early settler of what is now Virginia Beach, Virginia. English : Adam Thoroughgood House, built circa 1719. Thoroughgood was a prominent early settler of what is now Virginia Beach, Virginia. Main building of Moscow State University on Sparrow Hills in Moscow, Russia. English : Main building of Moscow State University on Sparrow Hills in Moscow, Russia. Bridge from the Bicentennial Rose Garden to the NATO Vista, Norfolk Botanical Garden, Virginia. English : Bridge from the Bicentennial Rose Garden to the NATO Vista, Norfolk Botanical Garden, Virginia. English : Re Lear is a 1910 Italian silent adaptation of King Lear by Gerolamo Lo Savio, starring the Italian diva Francesca Bertini. View of the ancient houses in Machu Picchu, Urubamba Province, Cusco Region, today Peru. The 15th-century Inca citadel, abandoned one century later, is situated in the Sacred Valley on a mountain ridge 2,430 metres (7,970 ft) above sea level. English : View of the ancient houses in Machu Picchu, Urubamba Province, Cusco Region, today Peru. The 15th-century Inca citadel, abandoned one century later, is situated in the Sacred Valley on a mountain ridge 2,430 metres (7,970 ft) above sea level. English : Silverfallen (The Silver Falls) in Skövde municipality, Sweden. English : Demonstration of a gin trap, at the Black Country Living Museum. It is the type of trap used for Wild Boar, and other animals of similar size, and is now illegal in many countries, due to the suffering caused once the animal is trapped. English : This color-enhanced image of a massive, raging storm in Jupiter's northern hemisphere was captured by NASA's Juno spacecraft during its ninth close flyby of the gas giant planet. English : Computer-controlled baggage carousel at Heathrow Airport's Terminal 2. A second delivery chute is visible, top-right. Schematic representation of the two methods with which to assemble a nuclear fission bomb. English : Schematic representation of the two methods with which to assemble a nuclear fission bomb. English : Theatrical trailer for Lawrence of Arabia, a 1962 film by David Lean. October 31st is Reformation Day in Germany and Austria.